When the migratory songbird was added to the endangered species list in 1995, it was mainly because of habitat loss caused by human development. It also gets bullied by another bird species, the brown-headed cowbird, which destroys its eggs and steals nests. 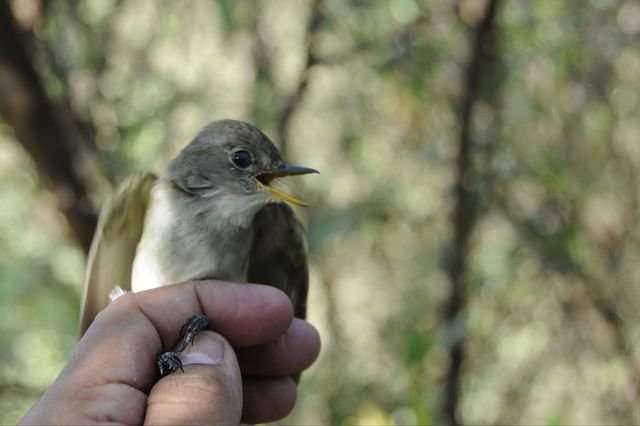 Now, according to a UCLA-led study, the willow flycatcher is facing another threat: climate change. Of the four subspecies of willow flycatcher, three have breeding grounds in California and are listed as endangered by the state's Department of Fish and Wildlife. Because the southwestern subspecies, one of those three subspecies, is listed as endangered by the federal Fish and Wildlife Service, ecologists and conservation biologists have studied the birds closely for decades. Scientists have tried to gather information using traditional research methods such as attaching unique identification bands to the birds' legs, but that provides only limited data because too few of the birds are recaptured for further study. The paper, which was published in the journal Ecology Letters, found that certain groups of willow flycatcher—those that live in certain geographic areas—are still in danger of decline and potential extinction. "Rare populations are the most threatened by climate change, and the southwestern subspecies that's already endangered is the most vulnerable, based on our analysis," said Kristen Ruegg, a UCLA assistant adjunct professor and the paper's co-lead author with Rachael Bay, a UCLA postdoctoral fellow. Scientists generally agree that there will be an increase in the number and severity of heat waves over the coming years, due to global warming; this would pose a particular challenge for birds like the flycatcher, Ruegg said. Small-bodied birds dehydrate more quickly, which increases the risk that they will die from overheating. The flycatcher relies heavily on "riparian" habitats—lush areas along rivers and other bodies of water. Unfortunately, those places are prime targets for development, so some of those habitats could disappear. "When they dry up and go away, there goes the habitat for the southwestern willow flycatcher," Ruegg said. While Ruegg and Bay brought expertise in genetics to the research partnership, study co-authors Eben Paxton of the U.S. Geological Survey and Mary Whitfield, research director at the Southern Sierra Research Station, contributed their deep knowledge of the bird species. "In general, the population of willow flycatchers in California has been on the decline for quite a while," Whitfield said. "It used to be pretty widespread in the Central Valley, and now you rarely see it at all except when it's migrating through." The flycatcher spends its winters in Central America and migrates as far north as the Canadian Rockies to breed. Its diet consists largely of flying insects, which are in greater abundance near bodies of water. Whitfield estimates that fewer than 3,000 remain in existence. With information from the new study, conservationists will be able to focus on protecting places that are important to the flycatcher—particularly areas along bodies of water in the southwestern U.S., Mexico and Central America. The researchers also found that genes that dictate whether the birds can tolerate warmer temperatures may allow some groups within the species to adapt to changing climate conditions better than others. The researchers now are exploring that potential genetic basis for climate adaptation in greater detail. The research is the latest effort of the Bird Genoscape Project, an initiative founded by UCLA professor Tom Smith that uses genetics to understand and inform conservation of migratory birds across the Western Hemisphere. The project helps map breeding, migratory and wintering grounds of bird populations while identifying the potential impact of climate change. Smith said the implication of the new study go beyond the endangered flycatcher. "This subspecies of flycatcher is sort of the canary in the coal mine," he said. "If we can detect impacts on this species, chances are that climate change is also going to be affecting other species as well." Ruegg said aggressively protecting natural areas near bodies of water is one of the most important steps people could take to make sure the willow flycatcher doesn't disappear for good. "Our work supports the idea that riparian areas should be protected at all costs," she said. "These are regions that can potentially buffer remaining populations form temperature extremes, and such buffers will likely be critical to survival of many species as the intensity and frequency of summer heat waves increases."